Daniel joined a trash garage band Welcomin' committee in flames. Check it out at your local venue! After finishing teaching in Linz, Daniel started to teach at "Animation and new media department" at Academy of fine arts in Zagreb. Daniel was invited to be a part of an international jury at 6th Teheran International Animation Festival. It was a great pleasure to be a part of it! At it's 17th International Exibition of Drawing, the Museum of modern and contemporary art in Rijeka, Croatia, staged a special exibition dedicated to animated films and drawings, which included some of the finest artists of animation. The exibition called "To the very last drawing" was held from 04.12.08-17.02.09. Daniel was invated with his film "Film with a girl". On 30.01.09., during the Rijekas Night of Museums, Daniel was there and did some live animation inprovisation-drawings at the museum. Gute Nacht John-Boy play another gig at Fluc, this time upstairs. Daniel started with his work on a new film called IN CHAINS (Croatian: U Lancima, german: Zustände). Galerie Thoman from Insbruck decided to send dvd copies of the film "Short life" as a Christmas present to its 110 best customers. A big premiere! Daniels new band, GUTE NACHT JOHN-BOY will have its first appearance at the RADIO ORANGE birthsday party which will be held in Fluc, Vienna. Great way to start a new band! See you there, you are all invited!! Daniel was invated to be a member of the competition jury at WORLD FESTIVAL OF ANIMATED FILMS, Zagreb. For him it is a very big honour, because the festival, also called Animafest is one of the most important festivals in the animation festival circuit, with a huge tradition. Zagreb is his home town and that was the place where Daniel, in his teen years, infinitely fell in love with the art of animation. Gallery Thoman from Innsbruck staged a solo exibition of Johanna Freise and her art comics, including the original comic Kurzes leben, the original drawings from the film and the film itself. Feel free to visit it! Kurzes leben takes part in the exibition "Mit eigenen Augen", Heiligenkreuzer Hof, Wien, Die ehemalige Meisterklasse Lassnig, where former Lassnig students, now mostly established in the art world, exibit recent works. Daniel's films will be screened at the "Lange Nacht des Films 2007" (a long night of films), a yearly screening organized by Martin Anibas at Galerie Blaugelbezwettl, in Zwettl, Austria. Feel yourself willkommen there, and don't forget to bring a BIIIIG popcorn bag with you. More excellent news for "Kurzes leben"! It was awarded a special mention at Animateka in Ljubljana!! Yippi-yeah!!! Speciality of Animateka is that every jury member has the right to give one special mention to a film of his personal choice, and in this case it was Marco de Blois who chose this film as his favourite. Many thanks! Link to a video from press konference is here. "Kurzes Leben" will be shown in competition program of 4th Animateka festival in Ljubljana, Slovenia. Daniel will be there so, see you all there! 03.11.07 Excellent news for "Kurzes Leben"!! It was awarded the GRAND PRIX at the "Animation day Croatia", held in Zagreb, a one day festival organized by Croatian national ASIFA chapter. In Croatia, this day is being used to show national yearly productions, all kinds of films, from children and students to professional works. As you probably know, such screenings, dedicated to promote the art of animation, are being organized in different countries across the globe, on the occasion of 28.10., which is proclaimed as the international animation day. A grand opening of ASIFAKEIL in quartier 21, at MUSEUMSQUARTIER in Vienna, accomplished with a group exhibition of asifa austria members! The exhibition "tricktransmission - miniwelten" is opened from 15.09.-31.10., everyday from 16-19h. 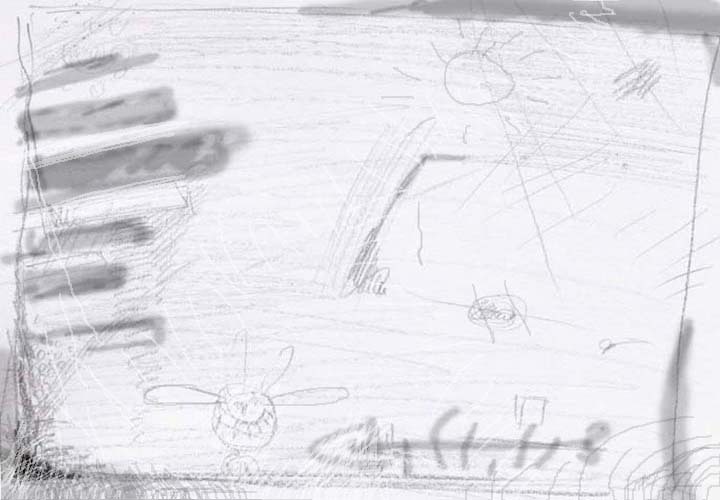 The exhibition includes film screenings and different original works (drawings, objects) from the exhibited films, including a few pages of original lay-outs from Daniel's film "The Cake"
Next edition of Grand prix Fluc football tournament will be played on 27.05! Fluc Orange with Daniel is again taking part. Go orange go, you'll always walk alone!!! By the way, we have won it (again :-)!! Trebon Animation film festival invited Daniel to be their guest during the festival days. See You there!! ASIFA Austria decided to start a screening row at Asifa Austria studio. Renate Kordon and Daniel Šuljić were chosen to organise the screenings. Renate organized already the first one with the name "TRICKFILMPLATTFORM", on 25.5.07. If you read this on time, feel free to come! Next dj evening with film screening in Fluc, this time together with Jakob Krameritsch. We kiss Fluc! Bibliotheque Publique d'Information - Centre Pompidou organized an international animation day screening named "The Powder Masters" dedicated to various powder animation techniques (sand, coffee, salt). Along with films by Caroline Leaf, Alexandra Korejewo, Ernest and Gisele Ansorge two of Daniels films, "Sun, salt and sea" and "I can imagine it very well" were shown in program. We are happy to announce that great actress and singer Meret Becker agreed to do the voice of the main character for the film Kurzes Leben. She was recorded in Berlin, on a beautiful day, in tonstudio Sternenstaub, by Thomas Stern, a former member of Crime and city solution. Daniel was member of the student-jury at Animafest, in Trebon, Czech Republic. A big promotion of "Glupača" was held in Kinoteka in Zagreb. Glupača is a film created by Mare Milin, where Daniel directed it, after a scenario by Rujana Jeger. Institut für Medien/Audiovisuelle Gestaltung at Universität für künstlerische und industrielle Gestaltung in Linz, Austria, engaged Daniel as a lecturer for "classical" art animation. In Linz, which is, thanks to Ars Electronica, a kind of world center for electronics- based experimental art, the University would like to give it's students the opportunity to try "old school" animation, different technics like sand, cut-outs, oil on glass, drawings, pixilation, puppets... The main goal is that the students should check out the wide field of this art form, and if they learn to love it to give them the knowledge and possibilities to shape their own animated shorts. Daniel was invited to "International Forum for Animation,2005", at Digital Media Design Centre at National Yun-lin University of Technology & Science in Taiwan as a part of the Jury in a student competition. Besides he will give two lectures about art of making art animation, together with a screening of his films. ŠAF Čakovec and Edo Lukman invited Daniel to participate in the big anniversary meeting of this children workshops school. It was a very pleasant opportunity to meet other colleagues and to have a little chat sipping on a glass(es;-) of fine Međimurjes wine. Daniel organized another screening of animated films and was dj-ing again, this time in Fluc Mensa. Lifestyle disaster was dee-jaying again, in Fluc again. This time suiting the autumn feeling, mainly melancholic and sad songs. 2nd Fluc football tournament was held. Fluc Orange with Daniel tried to defend the title won at the 1st tournament, but were beaten by the other fluc team, FLUC White ballet, who finally won the whole tournament. Daniel organized another screening of some great animated films, this time in Fluc. It was a very rare opportunity to see such films in Vienna, films from such a great film makers like Bill Plympton, Rene Castillo or Marie Paccau among others. Daniel also dee-jayed again, as lifestyle disaster. Daniel organized a screening with a few animated films at "Keingeld", a half illegal cultural party middle in Prater woods. Fluc showed a small retrospective of Daniel's work. Daniel was also a dj on the occasion, as lifestyle disaster. "Ich kann es mir sehr gut vorstellen" entered the competition of International Trickfilmfestival Stuttgart. Besides, the film "Cake" was shown in a special program named "East side stories"
Film "Ich kann es mir sehr gut vorstellen " will be shown at Split film festival these days (22-28.09.). It is also invited to LEIPZIG dokart festival which Daniel will be visiting, next month, so see you there. STAMPEDO will be doing a concert in France, in Aix-en-Provence. It will be somewhere between 29.10-1.11. In that city there is also an animation film festival and as far as we know they showed "Film with a girl" in 2001.